A unit trust is a collective investment scheme that pools money from many investors who share the same financial objective. The fund is managed by a group of professional managers who invest the pooled money in a portfolio of securities such as shares, bonds and money market instruments or other authorised securities to achieve the objective of the fund. A unit trust is a collective investment scheme that pools money from many investors who share the same financial objective. Thefund is managed by a group of professional managers who invest the pooled money in a portfolio of securities such as shares,bonds and money market instruments or other authorised securities to achieve the objective of the fund. The diagram below illustrates the basic framework of unit trust in Malaysia. The SC is responsible for the regulation of all matters relating to unit trust funds under the Securities Commission Act, 1993. It has a set of guidelines for unit trust funds designed to safeguard the interests of the investing public and to facilitate the orderly development of the industry. Appointments of key participants to a unit trust fund, such as the appointment of management company, board of directors, chief executive officer, investment committee members and Shariah adviser, also comes within the regulatory purview of the SC. Investing in a unit trust fund enables the investors to enjoy the benefits and advantage of diversifying their investment and assets. All investments carry risks and investing in unit trust funds is not an exception. The value of the unit trust fund’s underlying investments changes from day to day, which in turn affects the value of the unit trust fund. As a result of the changing value of the underlying investments, the value of your investment in a unit trust fund can go up or down over time. By investing in a unit trust fund, investors are able to benefit from the expertise of professional investment managers who in turn are able to draw upon specialised research, market information and the expertise of a variety of third party investment analyst whose services would not normally be available to individual investors. Due to the large pool of funds available, a unit trust fund has more financial muscle compared to a direct investment in the stock market by an individual investor as he is therefore able to diversify more effectively (i.e. investments could be spread out more widely amongst a broad spectrum of securities than would have otherwise been available to an individual). This broad exposure helps spread and reduce risk. Minimisation of risk is achieved by investing in different types of asset classes, securities or sectors so that losses in one asset class or some securities or sectors will probably be offset by gains in other stocks. It is more convenient to buy and sell units in a unit trust fund rather than investing directly in shares of companies where prices and opportunities to transact depend on the supply and demand at that material time. A unit trust fund provides investors with simple, convenient and a less time consuming way of investing in securities than investing directly. A fund may underperform its benchmark due to the experience, knowledge and expertise of the manager and the investment strategies adopted. Liquidity risk refers to the ease with which a security can be sold at or near its fair value depending on the volume traded on the market. A fund may have no choice but to sell that security below its fair value due to low trading volume which in turn could cause the fund’s portfolio to decline in value. 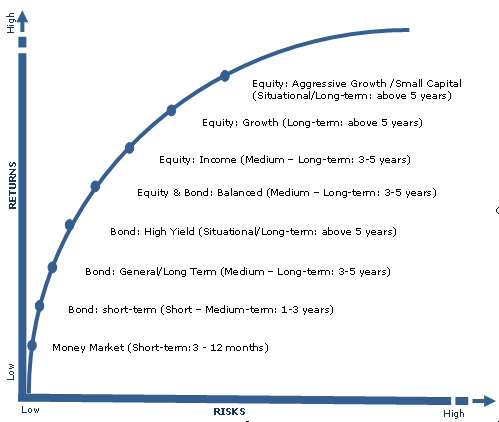 As a result of the risk elements, the returns from a fund are not guaranteed. The value of the Fund’s investment will vary when sold and an investment may be worth more or less than when purchased. Investors must be aware of the inherent risk involved with loan financing for investments including their ability to service loan instalments, which may be affected by increase in interest rates or unforeseen circumstances, such as loss of a regular income stream. Investors may be required to pledge units held in a fund or any other assets as collateral to cover the loan margin. In the event units are used as collateral, an investor may be required to provide cash or units as additional collateral if the unit prices fall beyond a certain level. If the additional collateral is not made within the prescribed time, the investors’ units may be sold towards settling the loan financing. This is the risk that the manager does not adhere to relevant laws, regulations and guidelines that govern the investment management and operations of a fund or a fund’s investment mandate stated in the deed. Non compliance could occur due to internal factors such as weaknesses in operational processes and systems. Non-compliance risk may adversely affect the investment of the fund. The manager may force sell the investments of the fund at a discount to rectify the non-compliance. This risk is mitigated by having sufficient internal controls in place and compliance monitoring program. This is the risk that inflation or the loss of purchasing power will erode the value of the investment returns and the worth of the investment itself. Investor’s returns from the fund may not be in-line with the inflation rate and hence reduce their purchasing power. Alternative investment products to unit trusts are deposits in financial institution, equities, derivatives and property investment. Unlike direct purchases in individual stocks, unit trust fund products provide investors the opportunity to pool their savings for the purchases of diversified portfolios of permitted investments. This will enable investors to invest in different types of investment instruments (such as stocks and bonds), thus enabling them to reduce risk. Fixed deposits, on the other hand, are generally safer with guaranteed returns though the returns may stand a higher risk of significant erosion from inflation as compared to investment products. You may be imposed with sales charge/entry fee when you invest in unit trust funds. Some fund such as bond funds may not impose any sales charge/entry fee. Some funds may have an exit fee which is incurred when you liquidate your investment. Switching fee is an administrative fee which is imposed on all switches between equity and non-equity funds. Transfer fee is an administrative fee which is imposed on the transfer of units to another beneficiary and between accounts of the same beneficiary. Operating expenses, which are paid from the funds’ assets, include annual management fee and trustee fee for its services, audit and other professional fees, commissions paid to brokers in effecting the investment transactions of the funds, tax and duties imposed by the authorities, fees for the valuation of any investment of the fund by independent valuers for the benefit of the fund, costs incurred for the modification of the deed of the fund other than those for the benefit of the Management Company or trustee as well as cost of convening meetings of Unit holders other than those convened by or for the benefit of the Management Company or trustee. The performance indicators, such as total return and average annual total return, serve to help investors evaluate the potential risk and reward of investing in unit trust funds by noting changes in the unit trust funds’ performance from year to year. Total return measures the change in the price of a unit trust fund, assuming that all distributions are reinvested and should be evaluated in light of the fund’s particular investment objectives and policies, as well as general market conditions during the reported time periods. Benchmarks are adopted to measure the performance of unit trust funds. For instance, an equity fund that focuses on Malaysian equities can adopt the Kuala Lumpur Composite Index (KLCI) or FTSE Bursa Malaysia 100 index while Shariah based equity fund typically adopts the Kuala Lumpur Shariah Index (KLSI). Bond funds may utilize fixed deposit rate as the benchmark. In the case of a balanced fund, it is a norm to use composite benchmark, for example 50% of the composite is calculated based on the percentage change of the KLCI while another 50% of the composite is calculated based on fixed deposit rate. The Management Expense Ratio (MER) is a useful way to compare the costs of investing in a fund with the cost of other similar investments. MER is the ratio of the total of all the fees incurred in a financial year and deducted directly from the fund (including annual management fee, the annual trustee fee, the auditor’s fee and other professional fees) and all the expenses recovered from and/or charged to the fund (including cost of printing, stationery and postage) expressed as a percentage of the average value of the fund. wants investment professional to manage his/her money. What Is Bond and Fixed Income? A bond is a debt security issued by a borrower who intends to raise funds . A holder of this debt is thefore owed the amount that binds the borrower to it with several variations of collateral or conditions that are specified to be met by the borrower. In Malaysia, bonds are issued by the Malaysian Government, Corporations, financial institutions, goverment agencies or sometimes specifically structured vehicles. The features of a bond include its nominal amount, price, its issue date, maturity date and a fixed or floating coupon if there is. Other examples of optional features may include but not limited to a guarantee (explicit or implicit), collaterals, charges, financial conditions and a rating. These bonds or fixed income securities (a term commonly used inter changeably) are traded in the Malaysian financial system amongst banks, corporations, other financial institutions like insurance companies, government agencies like pension funds and unit trust companies. The underlying purpose is to invest in an instrument that provides a given yield for a given period of time based on interest rates, credit , liquidity and economic conditions to meet the objectives of the investor.